Personalized Acrylic Tumblers in Bulk. 24 oz. BPA Free, w/ Straw. Cheap, Promotional. Wholesale Personalized 16 Oz. Double Wall Acrylic Tumbler with Straw on sale. We also supply blank (not custom imprinted) 16 Oz. Acrylic Tumblers for $3.99 each. 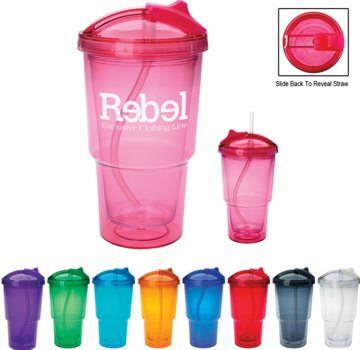 Lowest cost in USA and Canada for promotional Insulated Acrylic Tumblers. American clients pay no taxes. The unit prices below include your 1-color custom imprint on one side. We also supply blank (not custom imprinted) 16 Oz. Acrylic Tumblers for $3.99 each. PRODUCTION TIME: 3-5 days after art approval; Blank (not personalized) Insulated Acrylic Tumblers ship next day . Move Thumb Slide to Cover or Expose Soft, Pliable Straw. Colors: Translucent: Blue, Charcoal, Clear, Fuchsia, Green, Orange, Purple, Teal or Red, all with Matching Lid.